entertainment, history, literature, and many things in between. and a whole lot of in between. a bit of an understatement. As for the types of cards, there’s plenty of variety there as well. 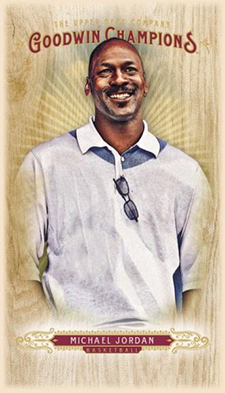 At the box level, this includes three hits or premium inserts. with exclusive cards for finishing specific parts of the checklist. features 100 base cards and 50 high-number Splash of Color short prints. Wood Lumberjack (1:20 packs) and Black Wood Lumberjack (#/8) mini parallels. The main part of the base set consists of 100 cards. Athletes from a bunch of sports, both mainstream and not, appear. Some other surprises can also be expected. Mini cards make their return. one per hobby box, landing 1:20 packs. with the Splash of Color SPs to fall in every other pack. These total 10 cards per box between the two sets. lineup stretches across many fields. 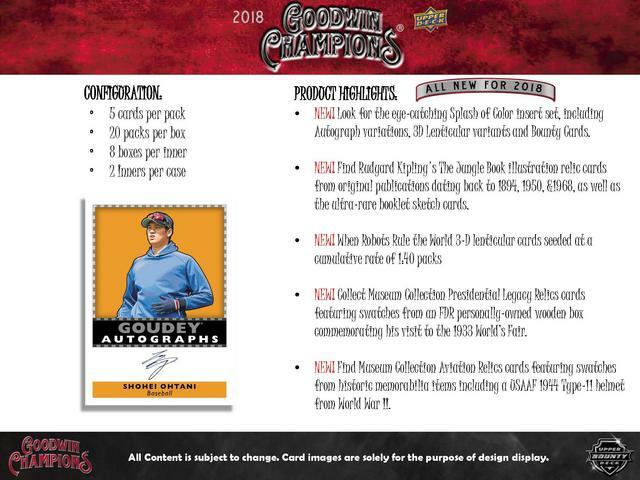 Goudey Sport Royalty Autographs (1:8,000) and Goudey Sport Royalty Dual Autographs (1:25,000). in New York City, or Medal of Honor recipient Dakota Meyer. There are also one-of-one Goodwin Cut Signature cards. from the 1933 World's Fair gift box owned by Franklin D. Roosevelt. 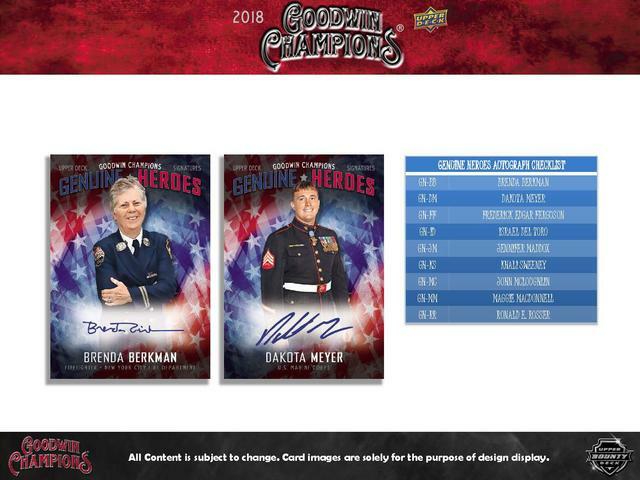 On-card signatures are the theme for the 2018 Upper Deck Goodwin Champions autographs. 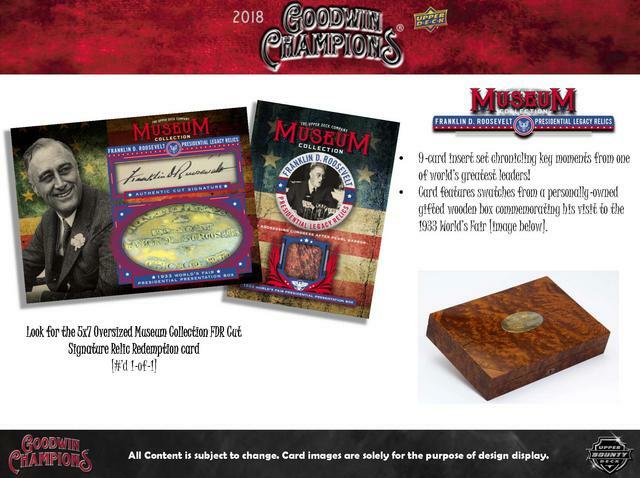 Goodwin Autographs (1:52 packs) feature signatures from base set athletes. to varying amounts and tough Splash of Color Autographs (1:1,280). in both single (1:8,000) and dual (1:25,000) versions. 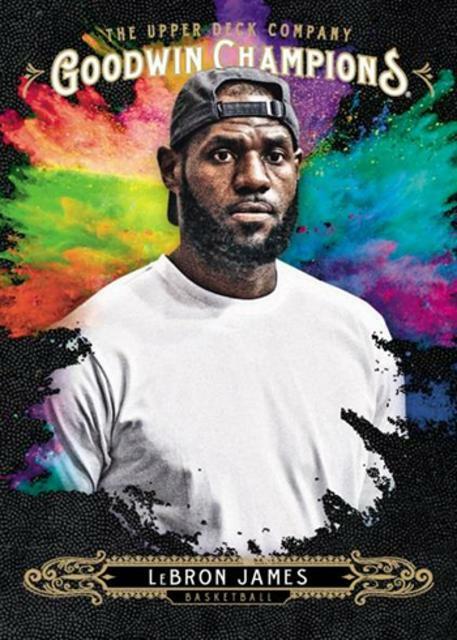 like Michael Jordan, Ben Simmons, Wayne Gretzky and Tiger Woods. to his growing autograph checklist, the first from Upper Deck. The nine-card checklist is filled with inspiring stories. to help kids with tutoring and mentoring. 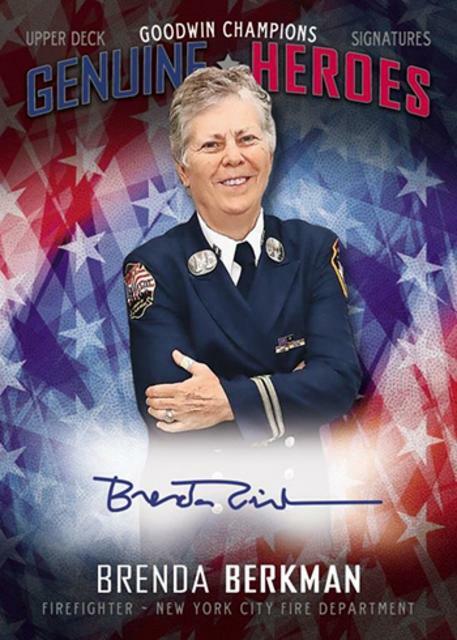 Brenda Berkman was the first female fighter in New York City. Khali Sweeney has a boxing gym for at-risk children in Detroit that doubles as an academic tutoring hub. are one-of-one Goodwin Cut Signatures. 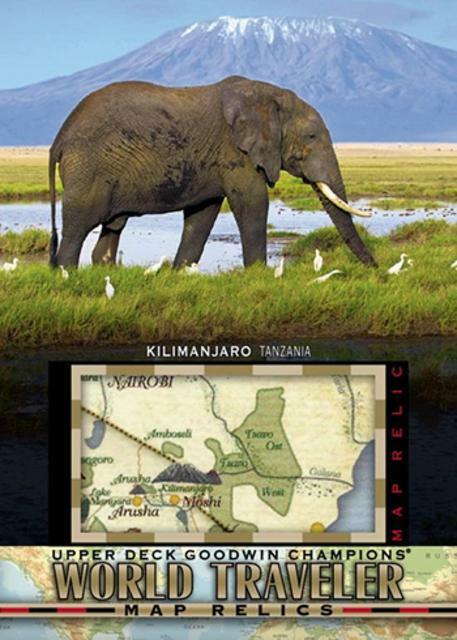 travel, historical flights, and even a timeless children's story. continues the love affair with man's best friend. The tiered patch rarity is broken down into six different groups. and even some relics from notable trips to space. 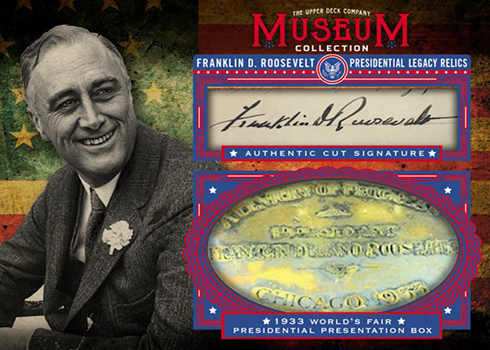 set features pieces from FDR's 1933 World's Fair wooden box. from various editions, including the initial 1894 release. and Dual Sketch Booklets (1:5,120). 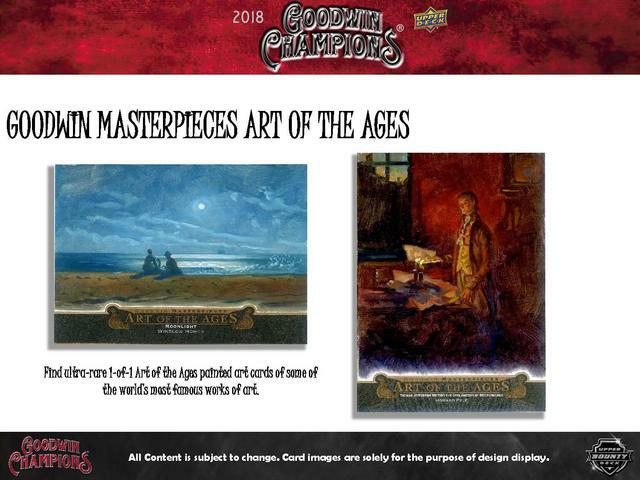 Art of the Ages cards, featuring hand-drawn recreations of legendary artwork. 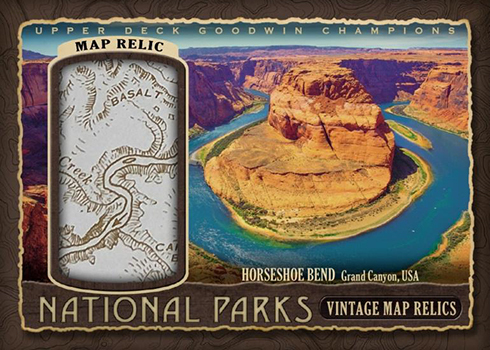 while the numbered National Parks Vintage Map Relics set stays closer to home. 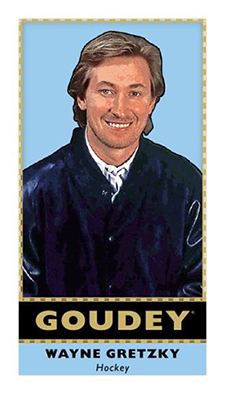 and Goudey Sport Royalty Memorabilia Dual Swatch (1:2,880) cards. Each memorabilia set also has a numbered Premium parallel. 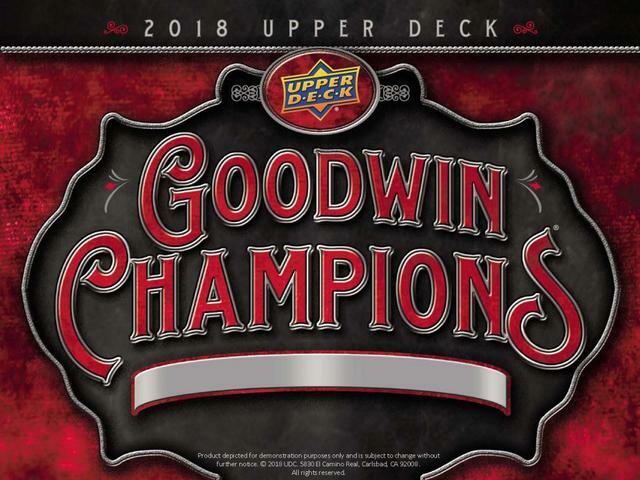 in 2018 Upper Deck Goodwin Champions. and Dual Swatch (1:240) versions. All three also have numbered Premium Swatch cards. Goudey Sport Royalty (1:1,520) and Goudey Sport Royalty Dual Swatch (1:2,880) cards. Relics go beyond articles of clothing and other gear. It takes a sharp veer into the realm of historical memorabilia. and National Parks Vintage Map Relics. Both come with pieces of maps embedded in them. from a high of 90 copies down to a low of 17.
are much tougher at 1:1,920.
on President Franklin D. Roosevelt. for visiting the 1933 World’s Fair in Chicago. 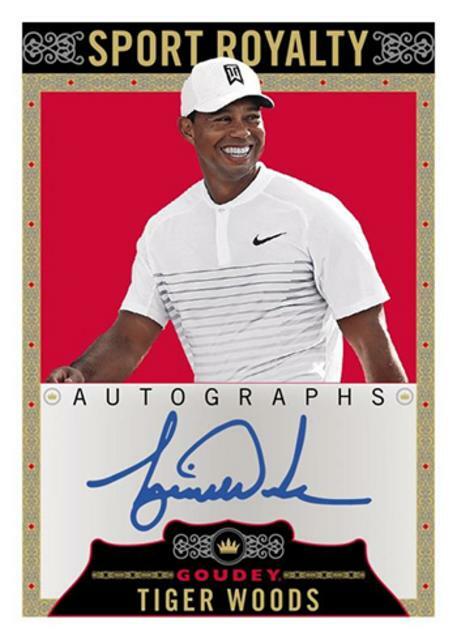 There’s also one over-sized redemption that also has a cut signature. come The Jungle Book Illustration Relics (1:3,200). from original copies of the Rupyard Kipling classic. 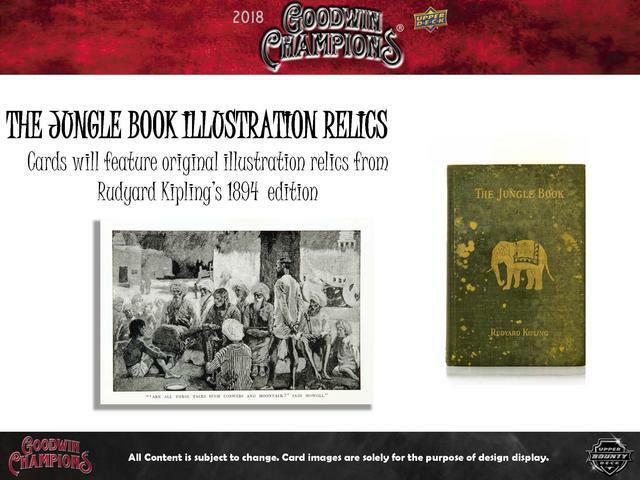 are Jungle Book Sketch Booklets (1:1,440) and Jungle Book Dual Sketch Booklets (1:5,120). 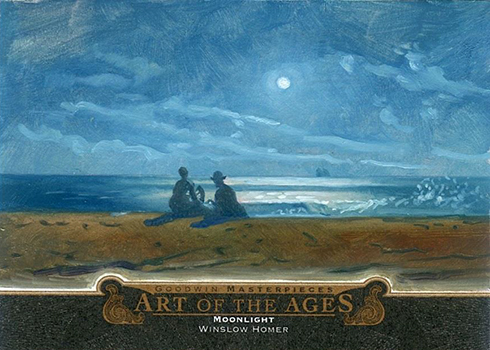 of the most famous masterworks in history. 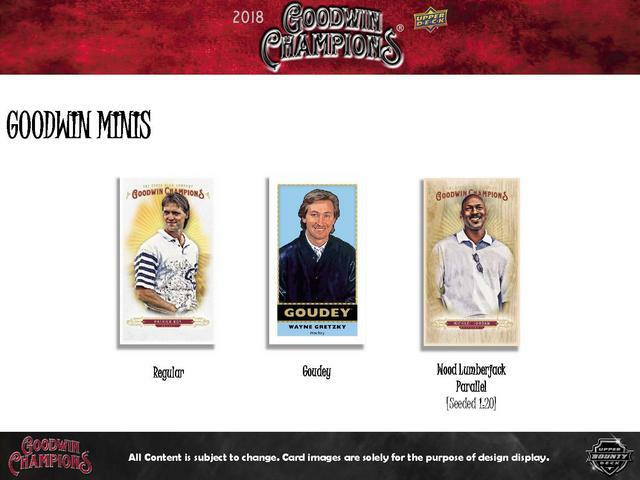 2018 Upper Deck Goodwin Champions some extra depth. to award what UD describes as "unbelievable achievement cards." Collectors must collect the very tough 20-card set to redeem the bounty. 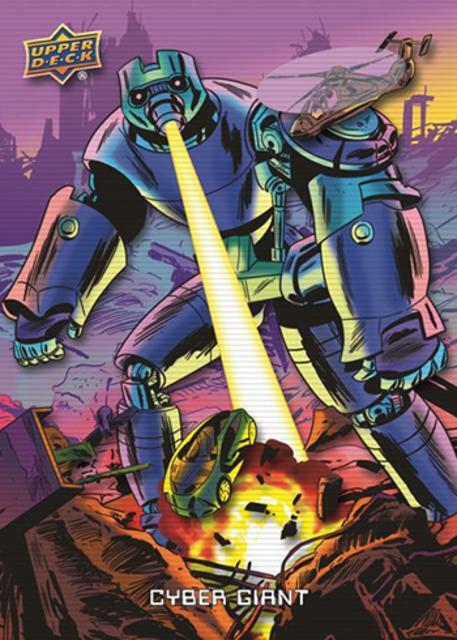 if the robots rise up against humanity. Signed versions from the artist are also in play. 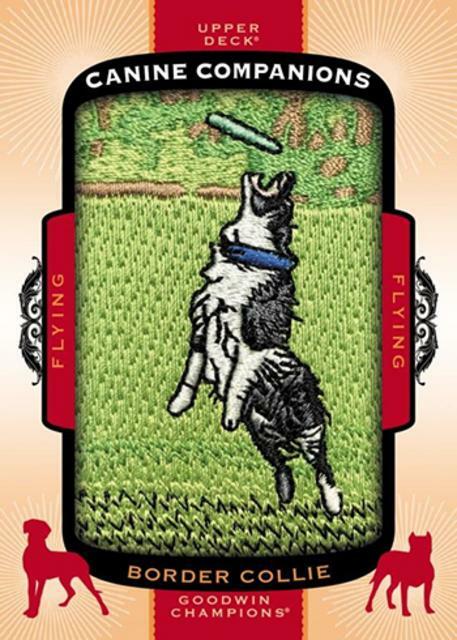 with Canine Companion Manufactured Patch Cards. (unless you fancy yourself as more of a cat person). These come with six different tiers of rarity. is the toughest at 1:7,500 packs. all using lenticular 3-D stock. to the challenge of building the full set. Autograph versions signed by the artist are randomly inserted. As far as regular inserts go, Goudey are fairly easy to pull at 1:4 packs. - 3D Lenticular Card in Every Box! 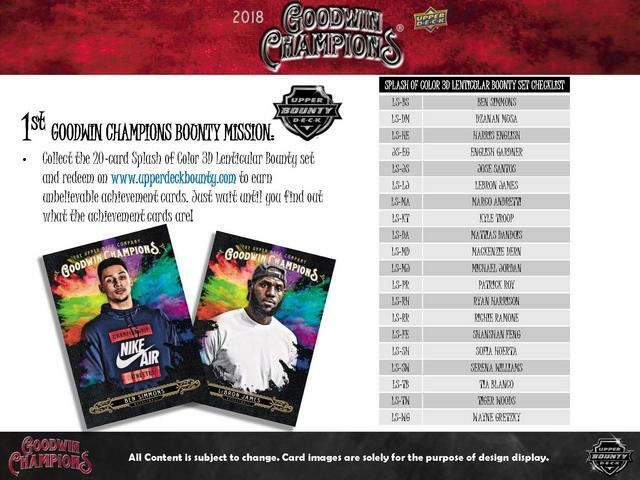 – Look for Autograph Variations, 3D Lenticular variant and Bounty Cards! Serena Williams, Tiger Woods, Wayne Gretzky and Many More!! Variant set and earn unbeliveable achievement cards! - NEW! 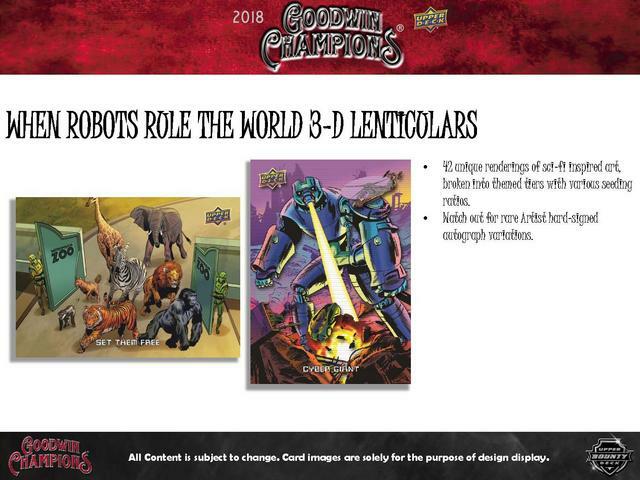 “When Robots Rule the World” 3D Lenticular Cards – Seeded at a cumulative rate of 1:40 packs. - Watch out for RARE artist hard-signed autograph variations. to the 1933 World’s Fair. from one of the greatest leaders in US history. including a USAAF 1944 Type-11 helmet used during World War II. 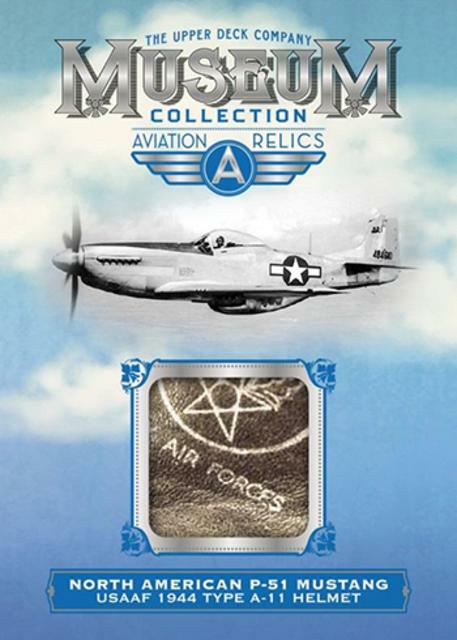 - Look for RARE oversized Museum Collection Aviation relic redemption cards. Brenda Berkman, Sergeant John McLouglin, Maggie MacDonnell, among other true heroes. 1950 & 1894, as well as the ULTRA-RARE sketch booklet cards. 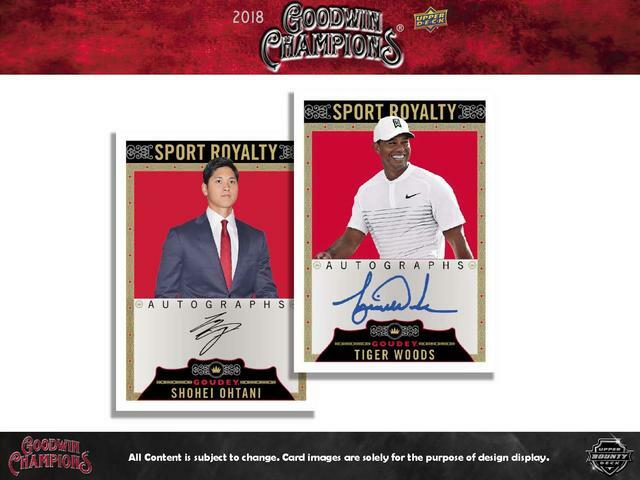 - Sports Royalty Autographs – Returning for 2018! from some of the finest athletes in the world. 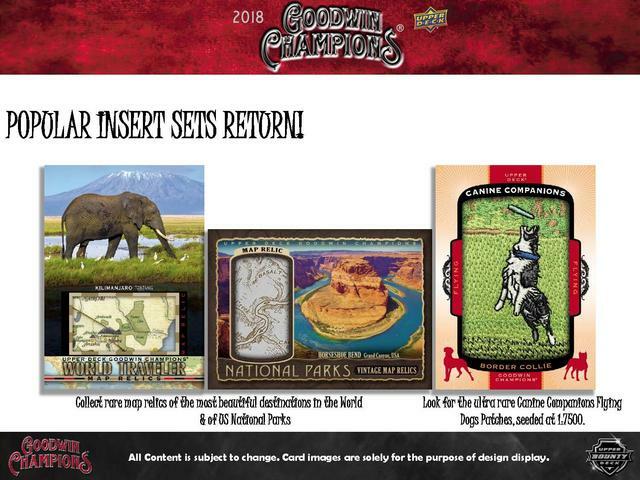 - National Parks Map Relics – Returning for 2018! - Look for rare map relics of the United States’ majestic national parks. – Returning for 2018! Broken into six tiers with various seeding ratios. of some of the world’s most famous works of art. from a wide array of interests. - 7 Mini Cards in Every Box! - 10 Splash of Color High Series SPs or Goudey Cards in Every Box! Dernière modification par Eyeshield21 le 12 sept. 2018, 12:19, modifié 1 fois. Overall odds - 1:52 Hobby/ePack - Specific group odds noted below. Overall odds - 1:8,000 Hobby/ePack - Specific group odds noted below. 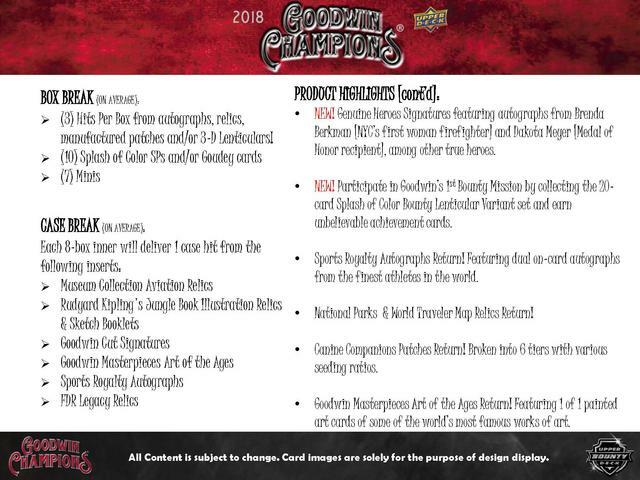 2018 Upper Deck Goodwin Champions Splash of Color Autographs Set Checklist 15 cards. Overall odds - 1:1,280 Hobby/ePack -Specific group odds noted below. 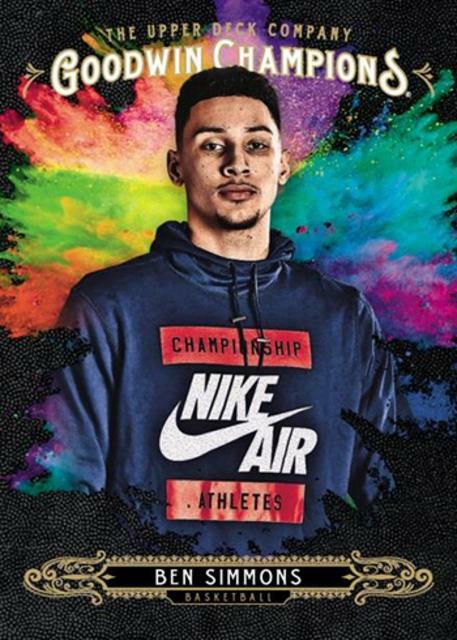 Ben Simmons - 1 per 20-card Splash of Color 3D insert set. Overall odds - 1:240 Hobby; 1:600 ePack- Specific group odds noted below. Overall odds - 1:300 Hobby; 1:600 ePack - Specific group odds noted below. Overall odds - 1:600 Hobby; 1:1,200 ePack - Specific group odds noted below. Overall odds - 1:480 Hobby/ePack - Specific group odds noted below. 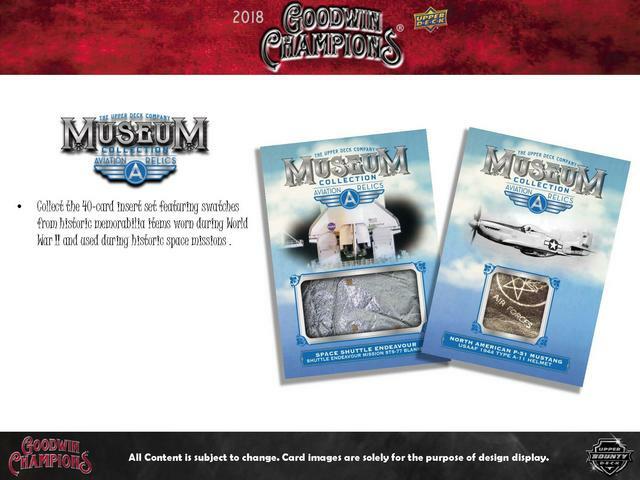 2018 Upper Deck Goodwin Champions Museum Collection Aviation Jumbo Relics Checklist 17 cards. Overall odds - 1:160 Hobby- Specific group odds noted below. Franchement ils font délirer avec cette série Upper Deck.